How’s an entry level cyclist going to know which road bike is the best without digging through thousands of reviews online? Lucky for you, we’ve combed through the best entry level road bikes—overall, it’s the 2017 Cannondale Synapse. Check out the rest of our article to see why we chose that bike as the best for beginners. The above links will take you to eBay, where you can check prices and see some similar bikes. What should you look for in an entry level bike? The right geometry and a properly fitted bike can make all the difference for a beginner. If you’re just getting into road bikes, you’ll want a bike that’s comfortable yet maneuverable, which translates into some different riding features and stats, which we’ll compare a bit later. It’s not a bad idea for entry level bikes to have a shorter stack and a shorter reach so that your rides will be more comfortable and more easily maneuverable while at slow speeds -- rather than the more aggressive racing feel a high stack and long reach provides. For entry level options, we also like longer wheelbases, which offer a bit more stability and comfort than shorter ones. Finally, though you may not want to hear it, your entry level bike should probably be on the heavy side. Heavier bikes can be a bit harder to truck around, but they’re more stable going downhill and much cheaper than lighter bikes. The downside of a heavier bike is that you’ll have more trouble climbing hills, and you’ll have less responsive handling, but until you’re more experienced in biking, it’s likely not worth dropping the cash for one of the top of the end light bikes. Let’s compare some of the geometrical nuances of these five bikes to quantify differences in riding experience. To do that, we’re comparing models as close to the same size as we can get. We’ll be using the 54cm versions of the Synapse and Domane, while we’re going to use the medium size for the Haanjo, which is a 53cm bike. The closest size the Talon comes in is 55cm, and for the Giant Defy 5, we’ll be looking at the large size, a 53.5cm bike. Interestingly, the Kestrel Talon has both a shorter stack and longer reach than the rest of the bikes, which, as far as fit is concerned, likely balances each other out a bit (instead of the longer reach contributing to a significantly more aggressive riding position). The other three are pretty similar. Effective top tube length = the distance from the saddle to the stem on a horizontal plane. The effective top tube length (ETT) entry-level bikes mostly hover around 54cm. The outlier is the Giant Defy, whose top tube reaches almost 57.5 cm, making either a bit better suited for taller riders or a lot more aggressives for normal-sized riders. The Kestrel Talon has a slightly longer ETT as well, although not significantly so, but it could flatten out your riding position a bit. 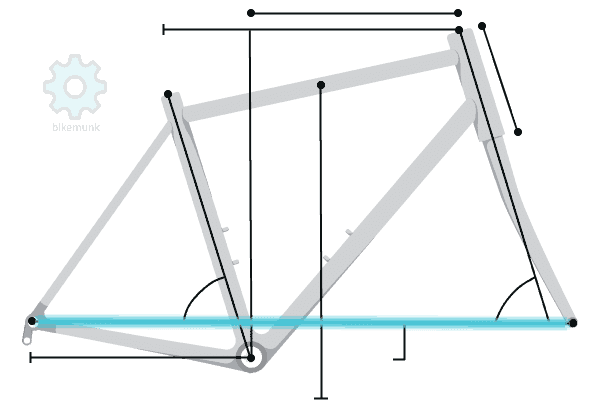 Chainstay length = the measurement between the bottom bracket and the rear axel. The chainstay lengths don’t vary much among these models, with a tight distribution of lengths around 42cm. The Diamondback’s 43cm chainstay might translate into a slightly more comfortable ride at the cost of some marginal cornering ability, but it’s debatable how much difference one centimeter can make. The shortest of the chainstay lengths belong to the Kestrel Talon and the Cannondale Synapse, each with 41cm. Again, not a super big difference, but you may notice a bit better power transfer with these bikes. Wheelbase length = the distance between the front and rear axles. There’s a bigger spread of wheelbase measurements among these bikes, ranging from the 103cm on the Diamondback’s wheelbase to the tighter 98.9cm of the Talon. Longer wheelbases are going to give your bike a more relaxed ride at the expense of being able to corner quickly and use your bike nimbly. For entry level riders, the stability offered by longer wheelbases may add to overall riding comfort. Of the bikes we’re reviewing, there’s a widespread range of weights, from the lighter frames of the Kestrel at 18.5 lbs to the heavier Giant Defy’s 24 lbs, although none of them are especially light. It’s worth noting that weight is often the biggest difference between bikes of different price ranges, and if you’re shopping around, you’ll probably find plenty of bikes that weigh less than these entry level options. In fact, it’s a good bet that most top-tier bikes will be lighter than all the bikes on this list, and that’s simply because lots of what you pay for when you move up in price is weight reduction. That doesn’t make these bad options by any stretch, and heavier bikes also have some benefits (a bit less willey, can be more durable, etc.). Cannondale’s Synapse is an endurance road bike designed to marry performance and comfort, which is especially evident in the standout suspension. It’s not the most aggressive or stiff bike you’ll ever ride, but that may not be best for a beginner anyway. They’ve also include quite a few little innovations that help squeeze respectable performance out of a pretty comfortable bike. The 2017 Cannondale Synapse Disc Tiagra uses a SmartForm C2 alloy frame. This frame is a step up from Cannondale’s other frames (their “optimized alloy” line). The major benefit of Cannondale’s SmartForm frames is the significant variation in tube thickness. Just eyeballing it, you’ll notice dramatic shape changes, especially compared to their other frames. Aside from optimizing toward performance, it just makes for great all around ergonomics and improves durability by taking stress off joints. The 2017 Cannondale Synapse Disc Tiagra uses a Shimano HG500 12-30 10-speed cassette in addition to an FSA omega BB30 50/34 chain set. It also uses Shimano Tiagra shifters and a Promax Render R 160mm/140mm brakeset. This is a 10-speed cassette, and it’s going to really shine climbing hills, but you’re going to lose a bit of speed on descents, but that’s usually a good combination for beginner riders: easier hills and safer descents. The disc brakeset may be controversial. You’ll get a significant bang for your buck compared to some other brakesets, but they’re also on the heavier side, and likely contribute to the Synapse being among the heftier bikes on the list. The Cannondale Synapse Disc Tiagra uses a Schwalbe Lugano 700x25c wheelset. This wheelset can do well in lots of different kinds of terrain, which means that if there’s a chance your bike will be used outside of the city, they won’t need to be changed out. It’s certainly not a top-end tire, however, and some riders report durability problems. Something not mentioned so far is what Cannondale calls the “power pyramid” bottom bracket, which is a bottom bracket that splits the seat tub (kind of looks like the seat tube has two legs), which does a nice job limiting torsion of the seat tube and transferring more pedaling power into the drivetrain. The frame is one of the major selling points for us. It performs well, but it also just looks slick. The wheelset ads versatility, and the innovative design of the bottom bracket makes pedaling more rewarding. The Cannondale Synapse is a slightly upgraded bike for someone looking at entry level cycles. While there are some standout features, the Cannondale’s price might be a turnoff to some, though the disc braking is likely a blessing in disguise for novice bikers, and the cassette works beautifully for riders at this level. The Trek Domain ALR is good for long distance rides and exploring amidst tougher more diverse terrain for riders who enjoy riding in an upright posture. Its designed to reduce rider fatigue and features a relatively short reach, making for a more upright ride. The Domane also features a slightly longer wheelbase than other Trek models, giving it more predictable handling than other Trek options. The Domane uses a 200 Series Alpha Aluminum frame with IsoSpeed technology. The ALR’s frame can take a beating and contains some minor flex points which absorb the shock of harsher terrain and prevents it from percolating through the frame to your back and muscles as a fatigue saving measure. You likely won’t have any trouble maneuvering the frame itself due to its average weight. This bike uses Shimano RS505 shifters, a Shimano 105 50/34 crank, a Shimano 105 11-32, 11-speed cassette, and a Shimano 105 chain. There isn’t much that’s too far out of the ordinary with this groupset, but you’ll find it to be reliable, easy to repair, and easy to transition between gears thanks to the double crankset and heavily sprocket laden cassette. The Domane uses a Bontrager R1 700x32c wheelset. The wheelset offers puncture and deflation protection, which means that you’ll be able to stay on your long rides for longer even if you knick a tire. The wheelset is also well insulated, which means you’re less likely to feel smaller bumps on the road as much as you would otherwise; it’s a small feature that can potentially save a lot of fatigue. Shock absorption is the name of the game here. All these little features add up to greatly reduce rider fatigue when taking the Domane out on bumpier roads, which is really nice. If you’re looking for a road bike that you’ll use mostly on the road with the occasional off-road excursion, the Domane ALR might be the right choice for you. It’s a durable bike that might be a bit over-engineered for city road biking, but could be a good entry level bike because of its forgiving feature set. “Everything takes a bold approach to allow you to ride with a more upright approach to reduce your fatigue and give you better handling than with other bikes.”- BikeExchange. The Haanjo Road Bike brings a lot of serious road bike features into an inexpensive package that does exactly what it sets out to do: provide an entry level road bike that provides substantial versatility, allowing you to ride in lots of different conditions. The Haanjo Comp uses a fully butted 6061-T6 alloy frame. This alloy frame isn’t the top of the line kind of alloy that allows for extreme weight savings, but it is a good start that’ll be durable and more than suitable for road use. You’ll appreciate the lightness of the frame compared to some other bikes, but the Diamondback is far from the lightest road bike around. The Diamondback Bicycles Haanjo Road Bike uses KMC Z99 9 Speed chain in addition to a Shimano Sora SL-3500 flat bar 2x9 speed shifter. It also FSA Gossamer Cross Mega Exo 46/36T cranks an a Tektro Lyra flat mount mechanical disc brakeset with 160mm front / 140mm rear rotors. The brakes are a standout here; they’re mechanically actuated disc brakes and give you great stopping power in nearly all weather conditions. The chain should give you enough gearing to get you up and over most stuff you’ll reasonably come across on most rides. This bike uses the Kenda Flintridge 700x40c wheelset. This wheelset isn’t going to win any awards for its durability, but it’ll more than get the job done if your interest is mainly in puttering around clean city roads. You may want to replace these wheels with more durable alternatives if you plan on taking this bike outside where the roads are well-maintained, as they’re not built for abuse. This is a super-versatile bike that will do well in a variety of situations, and switching out the tires can easily boost performance on, say, off-road rides. That said, it’s not a true specialist in any area and is may start to feel average as you grow into your cycling prowess. The Kestrel Talon Road Shimano Ultegra is a good road bike with a few top of the line features that lets it make brief forays into the gravel without ruining its gearset. With the stock crankset, it’s likely not the best climbing bike, but the aerodynamic design makes it nice and stable on descents. If you’re looking to invest in a higher-tier entry level road bike, the Kestrel Talon might be worth checking out. The Talon uses a Kestrel Super Light (KSL) 800K high-modulus carbon fiber PF30 BB Frame. Carbon fiber frames tend to have one major benefit, which is their weight. The Kestrel’s frame is no exception; it’s the lightest bike on this list. It’s also stiff, of course, which can reduce comfort, and the Kestrel already lacks lots of the fatigue-reduction features we’ve seen on other bikes. The Talon uses an Oval 300 50/34T crankset, Shimano Ultegra shifters, a SunRace 11-28T 11-speed cassette, and a KMC X11 chain. The Kestrel’s 50/34 crankset helps you keep your cadence high. You’ll have pretty granular control over your gear shifting, which is nice but may also be overwhelming for beginning riders. You might want to go with a higher cassette if you plan on doing a lot of climbing, though. This bike uses a Vittoria Zaffiro Pro 700 x 25c folding wheelset. The strong and weak point of this wheelset is that it’s foldable. The folds introduce points of roughness in your ride, add portability to the wheels themselves when they’re off the bike, and tend to reduce the durability of the wheelset overall. You’ll probably have to replace these wheels at least once. You'll have to make a decision about the foldable wheelset here and how much that convenience is worth to you in terms of overall durability. However, the frame is wonderfully light and could make up for it. In short, the Kestrel Talon Road Shimano Ultegra is a great bike that probably sits on the higher end of the budget for most beginning riders. It isn’t about to win any awards for comfort, either, but there are other bikes which do worse, and its other features make up for it. The Defy 5 is a bike that offers good performance, especially considering the relatively low price. The standout feature of the Defy is its riding position, which is designed to offer a good road bike experience with maximum comfort. The Defy 5 uses an ALUXX grade aluminum frame. This is a very upright, very comfortable frame. Giant produces all their frames in house, which means they typically deliver high quality frames for decent prices, and this one is no exception. It’s on stiffer side, but most riders say it’s surprisingly comfortable. The Defy 5 uses an FSA Tempo 34/50 crankset, Shimano Claris brake levers, a SRAM PG850 11x32 8-speed cassette, and a KMC Z7 chain. The Defy 5 drivetrain is a compromise in a lot of areas, the most obvious of which being in the eight-speed cassette. The eight-speed cassette will be sufficient for handling city hills and tough spots in smooth country roads but might leave you gasping for air on more difficult country terrain. One little detail we really like about the Defy 5’s setup, though, is the direct mount front derailleur, which definitely makes a difference in the crispness of the shifting. The Defy 5 uses a Giant S-R4 700x25 wheelset with 14g stainless steel spokes. This wheelset is sufficient for city and road biking. You’ll probably want a more robust wheelset if you decide to bike a lot on country roads, as these wheels aren’t known for their structural integrity. This is a solid entry level bike, especially if comfort is important to you. The price point is attractive, and it’s easy to ride. You probably won’t be winning any races on it, however.